This entry was posted in Political Correctness, Political Philosophy, Politics and tagged Conservacuck, Conservakin, Cuckservative. Bookmark the permalink. Conservative peoples just deeply care about God, and they care about causes that God would care about. God isnt racist? Well he invent race maybe he thought it was better for race to stay appart who know? Is it really fair to depict anyone as being “triggered” when someone says something about how it does or doesn’t benefit the “white” community? Anyone who is not a racist should be “triggered” by such a statement. Only a white supremasist would be fine with such a comment. It appears that an argument is being made for someone being secretly racist because they adopt children from different races…huh? The idea that someone who would support legal immigration, but oppose illegal immigration, somehow secretly doesn’t care about it is nothing but leftist propaganda and makes about as much sense as adopting children of a different race because you only want to appear to not be a racist. I’m coming to the conclusion that the Alt-right is far enough right to meet the extreme left coming around the other direction. Like Alt-right is just the right wing version of a Democrat. They seem to share a lot of the same opinions. Claude is on even stranger drugs than Ken, it seems to me. Hunh? My experience is that “support legal immigration, but oppose illegal immigration” is the orthodox left-wing position. People holding that position are the most likely to be proud of their immigrant ancestors (or selves) and to care about the whole issue. Ken seems to have gotten his idea of what is should be identified as leftist propaganda, and contrariwise of what leftists actually propagandize for, from some ver-ree strange source. What a horrible article. 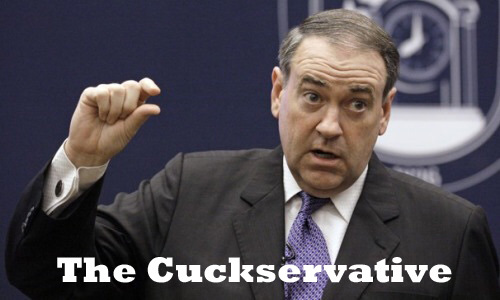 You would characterize me as a “cuckservative” because I have adopted a child from Ethiopia, I’m an Evangelical Christian, I love Israel and I love America. I don’t think we should just let people FLOW into our country illegal yet fully support legal immigration (our daughter came in the LEGAL way and it took us a LOT of time to do this). What is wrong with any of the above? You are seriously jaded. There is something wrong with the way you think. I have never seen anyone so fascinated with calling a people group racists simply because they chose to have a child another way. We truly wanted another child and knew that there were countless orphans who needed a home, so we decided to adopt. We prayed about it and felt the Lord calling us to go to Ethiopia. If we hadn’t done this our daughter would’ve continued to be sexually abused by many people. Would that have made you happier? Should we have left her there to suffer for another couple of decades before succumbing to AIDS forced on her by others so YOU would be happy? You, sir, are the racist who chooses to do nothing about the orphan issue. God forbid people think of YOU as a racist so you choose to not help a child. Your reputation is more important, isn’t it? Well, we will continue to love all of our children, have them all grow into self-sufficient citizens who will help others. I’m very sorry for you. Pingback: Notable readings of the day 08/28/2018 | "What Are You Sinking About?" Hey, nice article. Just confused about something, what exactly is a mestizo? is this an actual racial category or just a nickname for people from Mexico? If it’s an actual racial category then it can also be applied to people of Native North American + Irish descent, for example? On another note. Do Mexicans really abort that much? Any statistics? I’d be surprised given they’re usually catholic.